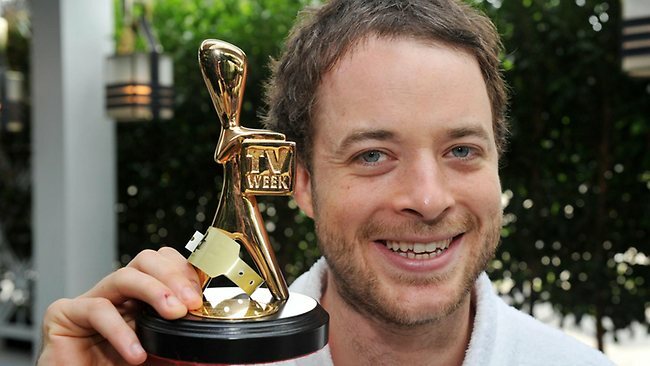 Comedian Hamish Blake has cropped up several times on the blog. His name was included in the post Boys Names That Only Chart in Australia, and we also took a look at how successful his name is. He’s had a dream run in the not-usually-lucrative field of comedy ever since he dropped out of a double degree in Science and Commerce to buddy up with Andy Lee as a comedic duo. Together they have had a ratings winning drivetime radio show filled with prank calls and the like, and several successful TV shows, most recently, Hamish and Andy’s Gap Year. Eventually it all paid off for at least one of them when Hamish won the Gold Logie for being the Most Popular Personality on Australian Television at this year’s Logie Awards. Blake is an English surname which has two different origins of opposing meanings. Both of them began as nicknames. One is the Old English blæc, meaning “black”, referring to someone with black hair or a dark complexion. The other is from blāc, meaning “pale”, referring to someone with very blond hair or a fair complexion. One theory is that the two nicknames were ethnically based, with the first denoting the dark Celts, and the second denoting the fairer Jutes, who were from Jutland (today it’s Denmark, and the bits of Germany that join on to Denmark). Although you’ve no doubt twigged that blæc became our English word black, it may not have immediately occurred to you that blāc is related to our English word bleak. Late in the Middle Ages, the two words were merged into blake, moving us closer toward the modern word black, but somehow immersing in it a word meaning the opposite. However, if you consider black and bleak together, they don’t seem quite so contradictory. The Blakes are an Irish aristocratic family, dating back to the Norman Conquest of Ireland, so you could see the first name Blake as derived from this aristocratic surname. However, those of a literary bent are more likely to see it as honouring William Blake, the visionary English poet and painter who was a seminal influence on the Romantics. If you are something of a sci-fi fan, the name may remind you of Roj Blake, from the popular 1970s and ’80s TV series, Blake’s 7. Blake reminds me of the much-loved illustrator Quentin Blake, as I was raised reading Roald Dahl‘s books, with the enchanting Mr Blake’s humorous drawings, which convey life and movement so effortlessly. My childish desire was to look as cheerfully plain and lank as the children that Quentin Blake drew; however to my disgust, my parents insisted on lots of fresh air, exercise and home grown produce, so that I remained obstinately tanned, rosy-cheeked and sturdy. Luckily I didn’t know enough about genetics to realise it was also their fault I wasn’t plain! Another Blake from the era of the 1980s was Blake Carrington from American soap opera, Dynasty. This ruthlessly wealthy oil tycoon, whose life revolved around kidnappings, comas and the search for Nazi gold, seems to have given the name a rather “preppy” image in the United States. We don’t have the word preppy here, but as far as I can work out, it means “offensively middle-class”. Perhaps someone more knowledgeable can enlighten me on this one? I suspect that here its image is a bit more relaxed (although rebel Blake Dean from Home and Away managed to have a rather tortured time in Summer Bay, even without any Nazi gold). Blake is often listed as a unisex name on international sites, although it is Top 100 for boys, and the only female Blake ever mentioned is actress Blake Lively from Gossip Girl. There is nothing especially boyish about the meaning of the name Blake, but its consonant-vowel-K sound has the same pattern as names such as Jack, Luke and Jake, giving it a masculine intonation (although it is a bit like Brooke, too). Although I could accept it as unisex, it’s seen as a male name in Australia, and you may get some resistance to using it for a girl. The similarity between Blake and the word bloke could well be keeping it in the boy’s club. Blake first entered the charts in the 1950s, and took off in the 1970s (hmm, Blake’s 7, anyone? ), so that it was Top 100 by the 1980s. It reached its peak in the 1990s, just outside the Top 20. Since then, it has fallen in popularity, although it is still in the Top 50 (and more popular in Australia than anywhere else in the world). Perhaps surprisingly, Hamish Blake doesn’t seem to have helped the popularity of the name, even though the name Hamish is doing pretty well for itself in the charts. Although statistically Blake has passed its prime, to many it fits into that handy category of Popular But Not Too Popular Names, and has many namesakes from popular culture which have garnered it affection. It’s a nice, short, simple name which sounds sporty, surfer and skater, but still has some room for art and poetry. I tend to think its real strength is as a middle name, however. That’s typical for names going down in popularity – everyone seems to know at least one person with the name. Whereas for names still going up, like Hamish, they still seem fresh or rare. I like Hamish. A friend of mine was thinking of naming her son this, but decided against it since they have no Scottish heritage. Instead they went with an obscure Dutch name. They are Dutch-American Reform from Michigan, so not surprising. Don’t want to share the name due to privacy 🙂 It is that unusual. Blake is also pretty trendy in the States. I think Blake was trendy in the 1980s, and now it’s just standard ….